display in the mail plane area. After the storm blew through my brother and I took off for Poplar Grove where we were to spend the night. We joined up about 10 miles south and 1000′ AGL. 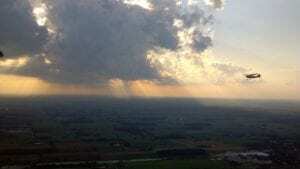 About 20 or 30 miles south I was flying on the Stearman’s right wing as we came upon the diminishing line of storms that had disrupted things at OSH an hour or two earlier. Suddenly my brother yelled at me on the radio, “Break out to the right, a little higher and and back a bit!” I immediately knew what he was wanting. So very quickly I broke wide, back, and up and just as I rolled my wings level he he pointed and shot two quick hail Mary shots in my direction with, of all things, his cell phone. Within moments that particular lighting situation had changed and there was no time for additional shots. He felt there was little chance of anything good showing up but after landing at Poplar Grove we looked at the two photos just in case. One photo was a bizarre abstract of optical glare, but the other one was this. So this photo was taken with about five seconds of setup from an 80+ year old open cockpit biplane with a cell phone camera. The 2′ x 3′ enlargement hanging on the wall above my computer as I write this is quite stunning. One funny side note to the photo. My tailwheel was flat when the photo was taken! Do You Have a Flight Training Story? Do You Know This Pilot?